Before you leave for work, you check your emails and review your budget from home. Your store opens at 11 a.m. In order to prepare for the busy day, you arrive at 10 a.m. Your store employs team members including managers, cashiers, drivers, and cooks. Your team prepares for the lunch rush by cutting up fresh vegetables and preparing the premium meats, fresh cheeses, and dough. Team members take orders at the register, over the phone and via the Papa Ray's website. As the orders come in, the food is prepared using the delicious Papa Ray's recipes. At around 2 p.m., the lunch rush dies down, and the team prepares for the dinner rush while accommodating the steady flow of customers. The team makes a fresh batch of dough and chops more vegetables to keep everything fresh for the afternoon guests. The dinner rush slows down at around 9 p.m. and the team begins to clean up the restaurant and restock for tomorrow. Papa Ray's closes at 2 a.m. Your restaurant manager, team, and the Papa Ray's business model, allows your restaurant run smoothly even when you are not there. This allows your hours to be flexible and helps you have the time to get your restaurant's name out there by visiting local businesses and advertising in your neighborhood. Pizza is a $40 billion a year industry and will continue to grow. Almost everyone eats pizza. It is inexpensive, fast, easily customizable and delicious. 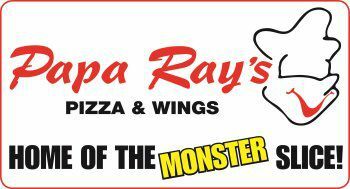 Pizza isn't going anywhere and neither is Papa Ray's. According to PMQ Pizza Magazine, over 3 billion pizzas are sold each year. Statistics show that 93 percent of Americans have pizza at least once a month.